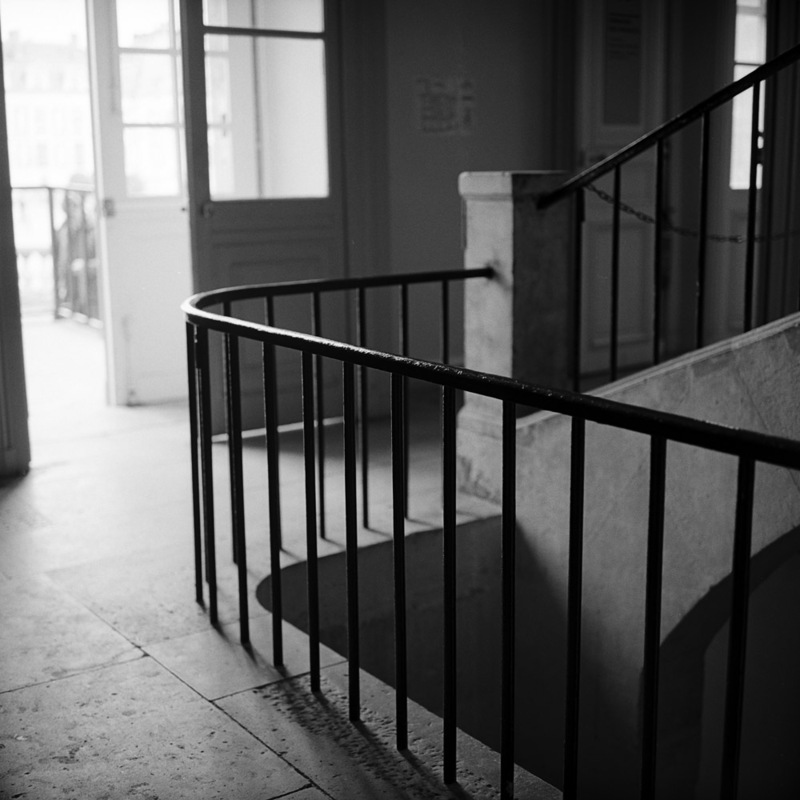 This is the last post in the Paris in October series – with this, I’ve finished uploading new images from the series. I may go back and revisit a theme or two that span multiple posts, like staircases, but I’m pretty much done. It’s been a long, fun ride – two months worth of postings from a single nine-day trip. A lot of work, but well worth the effort. I hope you all have enjoyed the series as I’ve been posting them. 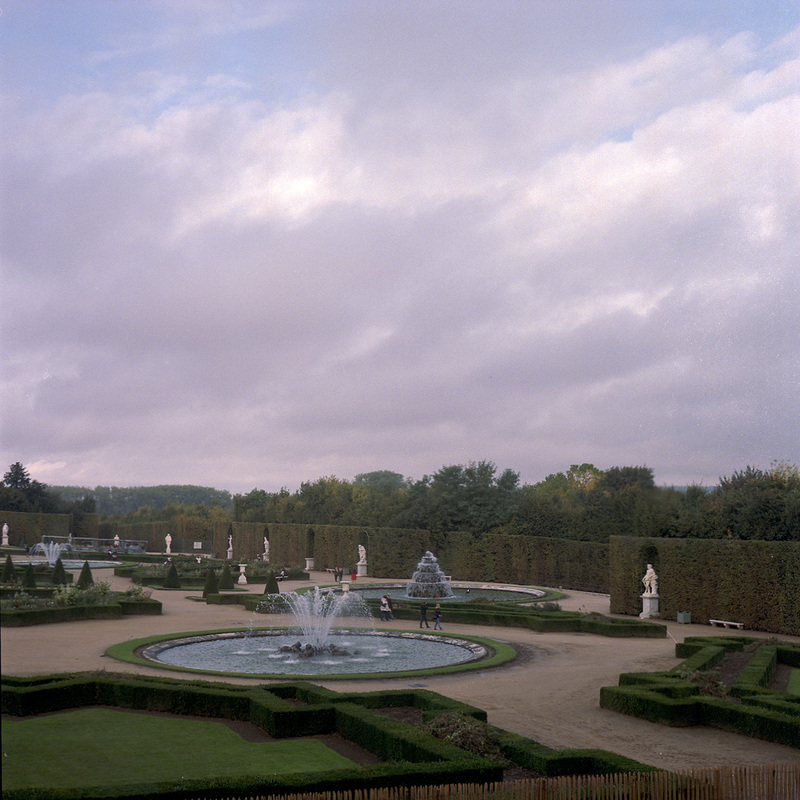 These are exterior views of Versailles, or at least view of/toward the exterior. 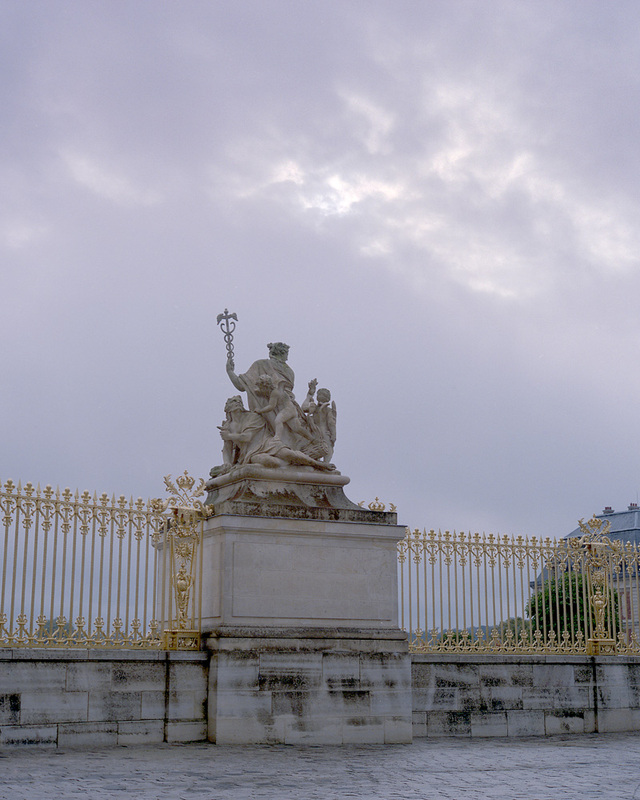 I did not go out into the gardens – my feet were worn out at that point and they wanted an additional 9 euros to enter the gardens because they were going to be doing the musical fountain show, so I did not get around to the famous garden facade of the palace. 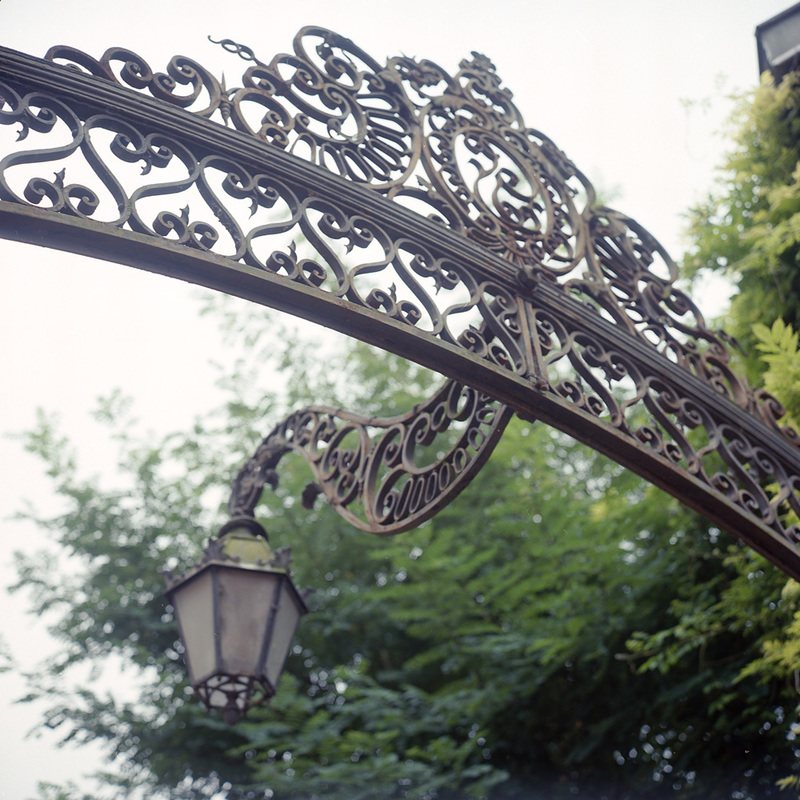 The entrance gates when you first approach are gilded iron. It’s one of the very first things you see, and it certainly makes an impression. 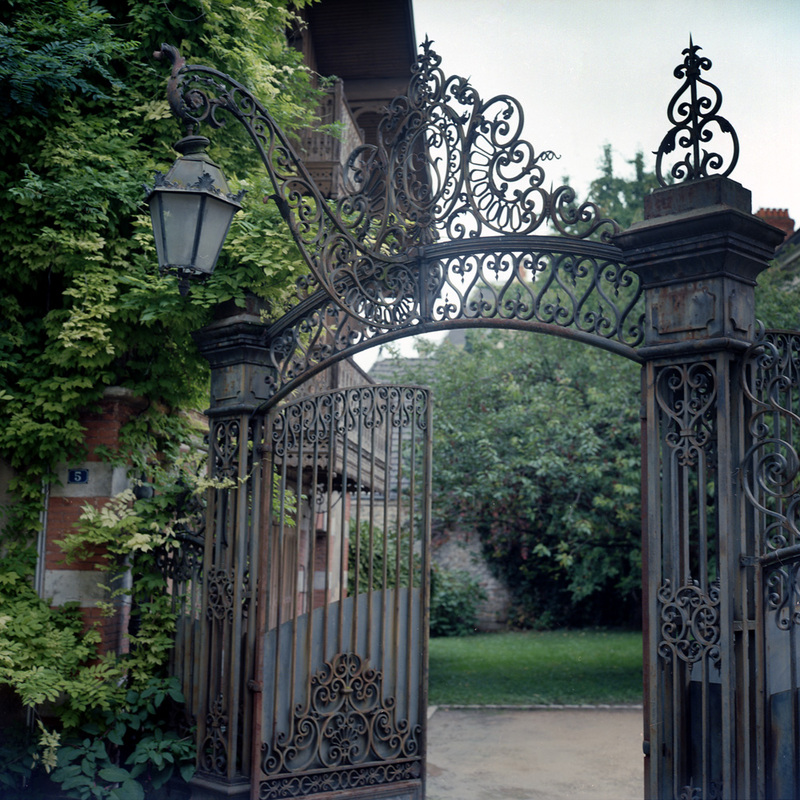 Impressive as they are now, can you imagine what it would have been like in the 18th century to walk up to these gates? 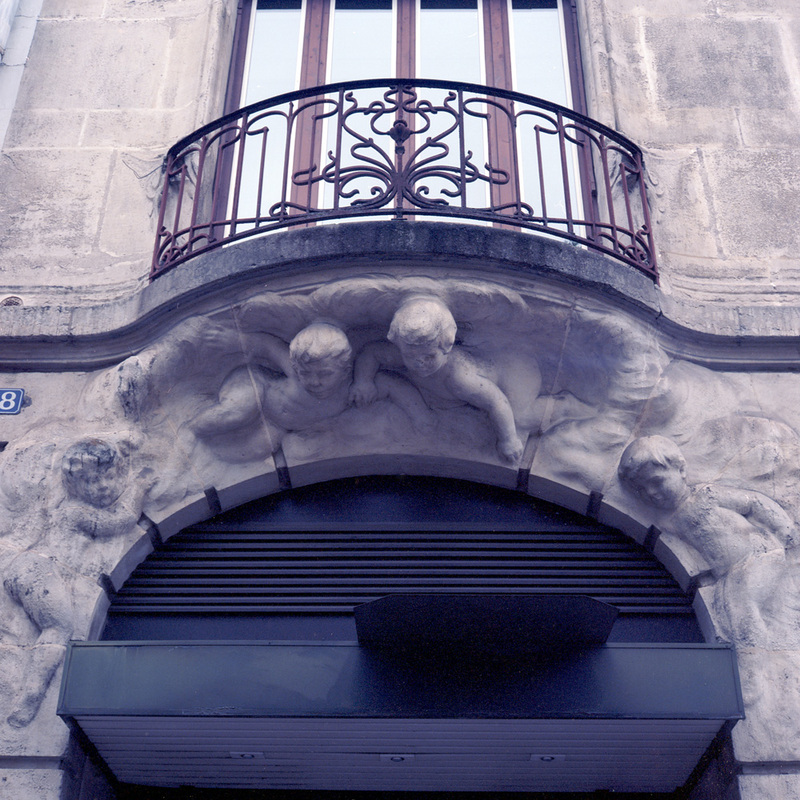 The words on the building portico say, “A Toutes Les Glories De La France” – to all the glories of France. For a shining period, that was literally true of Versailles. 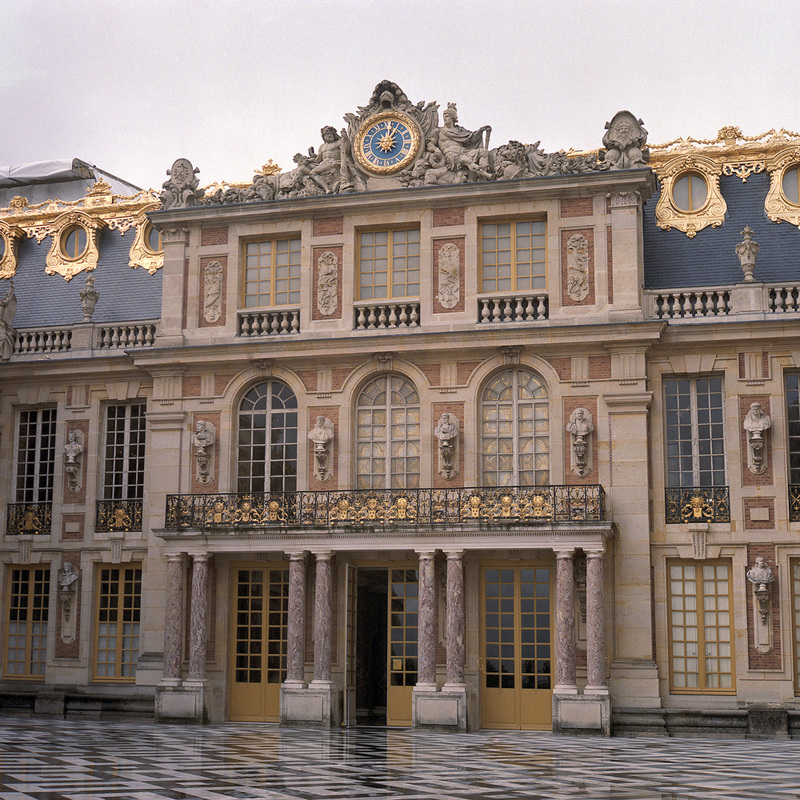 It encapsulated the magnificence and power that was the French state in the era of Louis XIV. I don’t know when that phrase was placed on the building – it has much more of a Second Empire or Third Republic feel to it. It doesn’t seem like something one of the kings would have done – the palace itself screamed that sentiment in spades, putting it down in writing on the facade was superfluous and a bit gauche. This is a view looking back at the town of Versailles from the palace entrance. The statue is the cousin of the one on the other side that I photographed in black-and-white with the grotesque figure providing a seat with its back for the allegorical female. This is the palace’s front door. You can tell this is one of the older parts of the palace by the style – some brick instead of stone, less monumental in appearance. 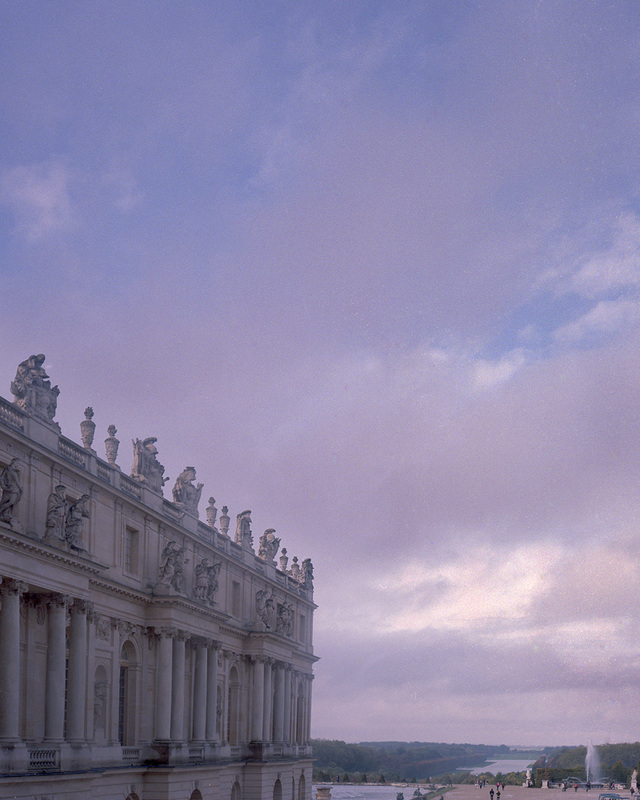 Less monumental, perhaps, but no less ostentatious. It had been raining that morning and so the marble tile courtyard surface was still wet. A view of the garden facade through a window of another wing of the building. The colors of the sky were beautiful with all the rainclouds breaking up. You can see down the long walk with the ponds in the middle, how far off the estate stretches. 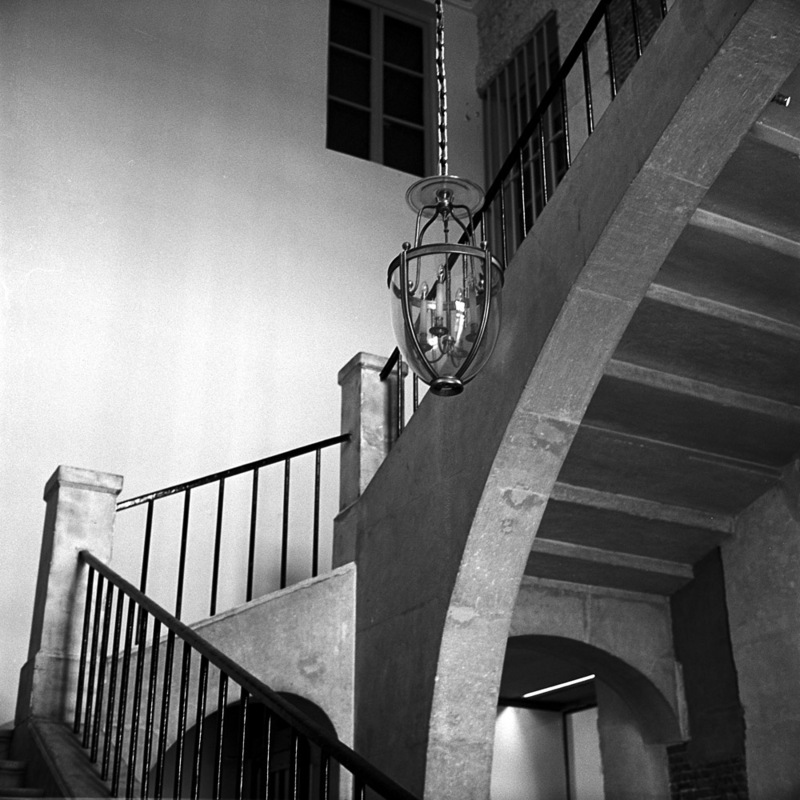 These first two are of the service stairs that lead from today’s restaurant and snack bar to the ground floor and the exit to the gardens. 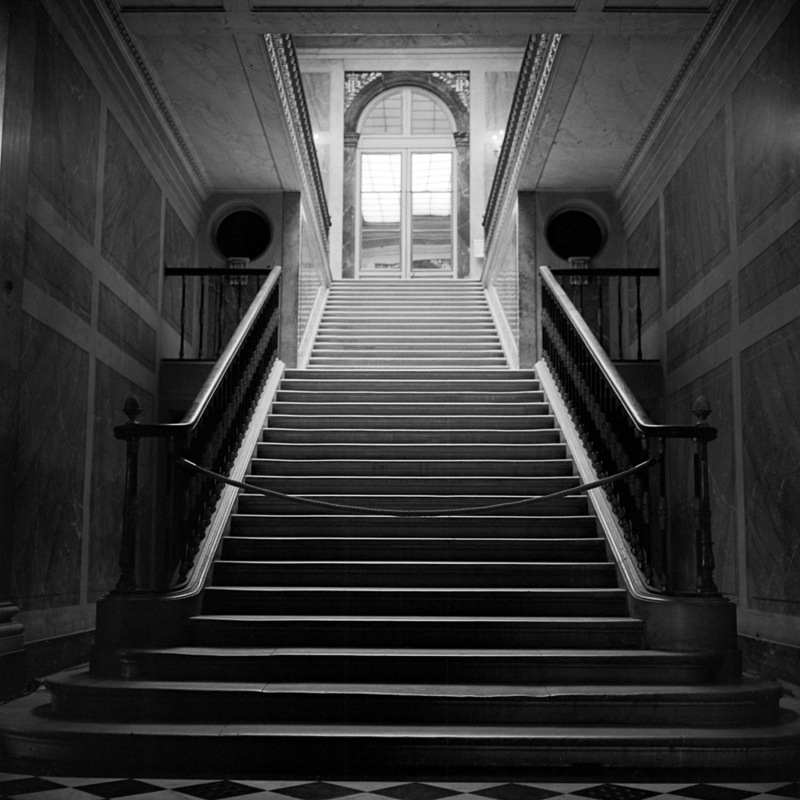 By the time I got to the dining room, my feet were screaming at me from all the continuous marching through the palace and across the cobbled courtyards. I did not eat in the main dining room but instead got a sandwich from the cafe. There was no place to sit (the only available tables were the stand-up kind, every chair was taken). 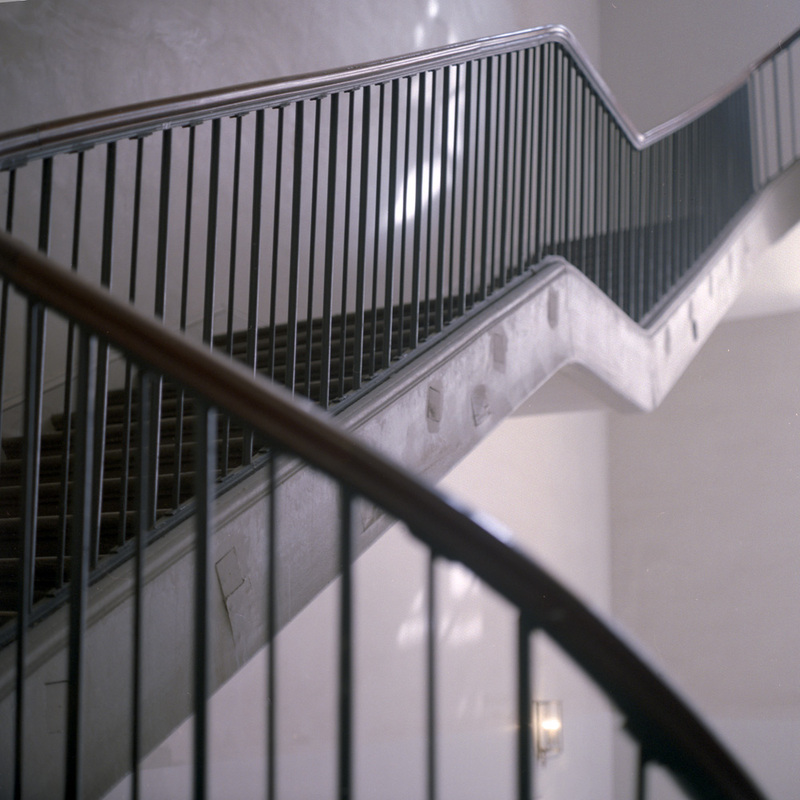 Leaving the cafe to be faced with this staircase, then, was suddenly a daunting task. What to do, then, but photograph it? To proof the images I wanted to scan and print bigger, I had a set of 5×5 inch proof prints made at the time of developing the film. Sometimes, the minilab prints looked better than my final scan results, but more often, they look worse. Based on the minilab prints, I excluded these two from my rough edit. Going back over the film while scanning everything else, I looked at the negatives and they looked good, so I took a whirl and scanned the first one. As it turned out, they were much better than I thought they would be based on the proof prints. These next two are a memory refresher from an earlier post. 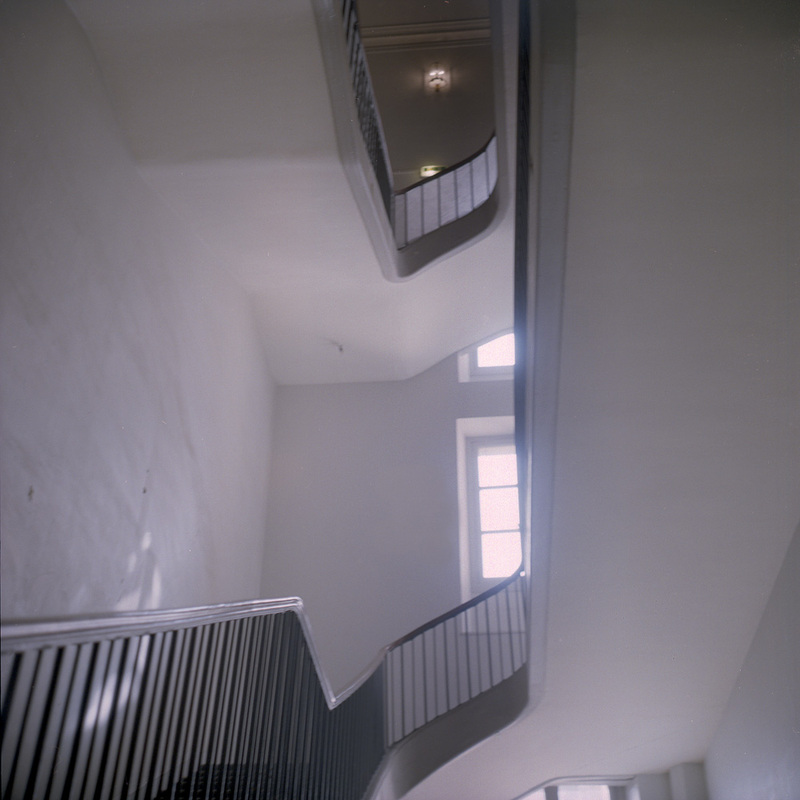 With the exception of the last photo in this post, the only staircases I photographed at Versailles, it seems, were service stairs. I guess everyone is content to ignore them and only pay attention to (and mob) the Queen’s Stairs. Their loss, my gain. I’m sure you’ve read my rant about how crowded Versailles was. It seriously cramped my style trying to photograph any of the spaces on the main circuit of the house, even with my cellphone. That said, the whining ends here. I’m happy with the pictures I did take; I just wish I could have taken more. When I go back, and I WILL go back, sometime, I’ll do things differently – I’ll do the gardens first, then the house, and I’ll go in the dead of winter, on a weekday. Preferably during a snowstorm. 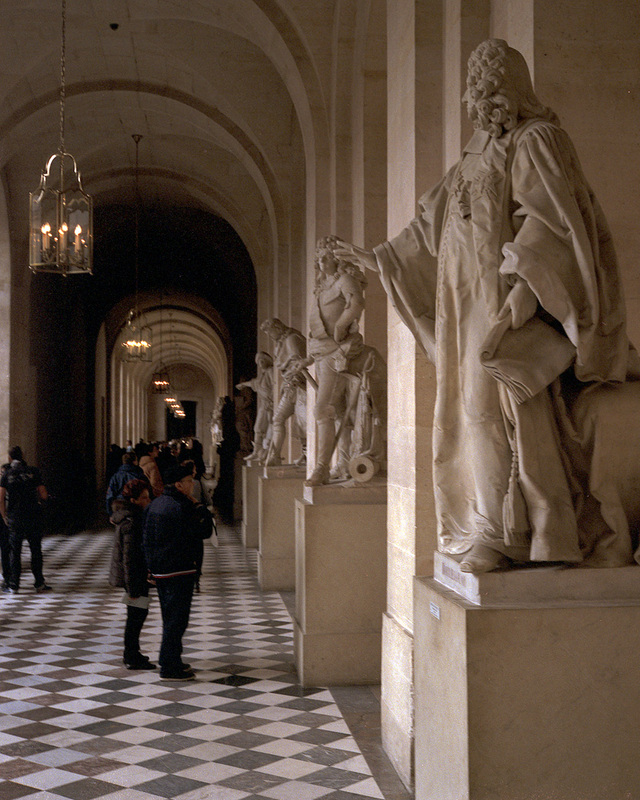 There are multiple halls filled with statues of great Frenchmen. Here are two such passageways, one with and one without tourists. The shot with tourists provides a human scale and a modern reference point for the house. The one without gives an architectural scale. 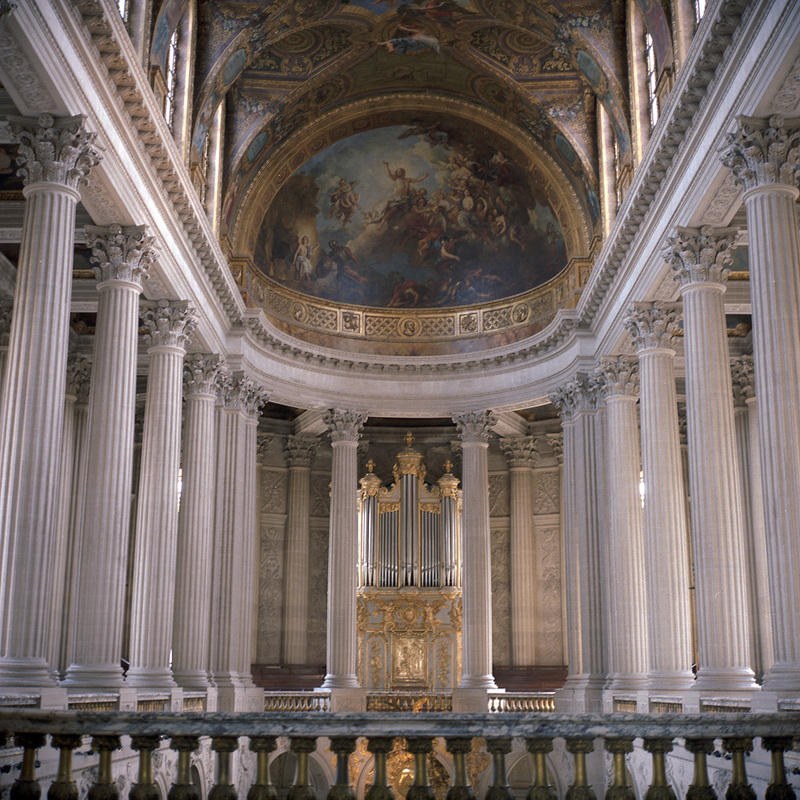 The royal chapel is one space in the palace that truly gives you a sense of not only the grandeur of the palace but also the extreme disparity of wealth between the aristocracy and the peasants. 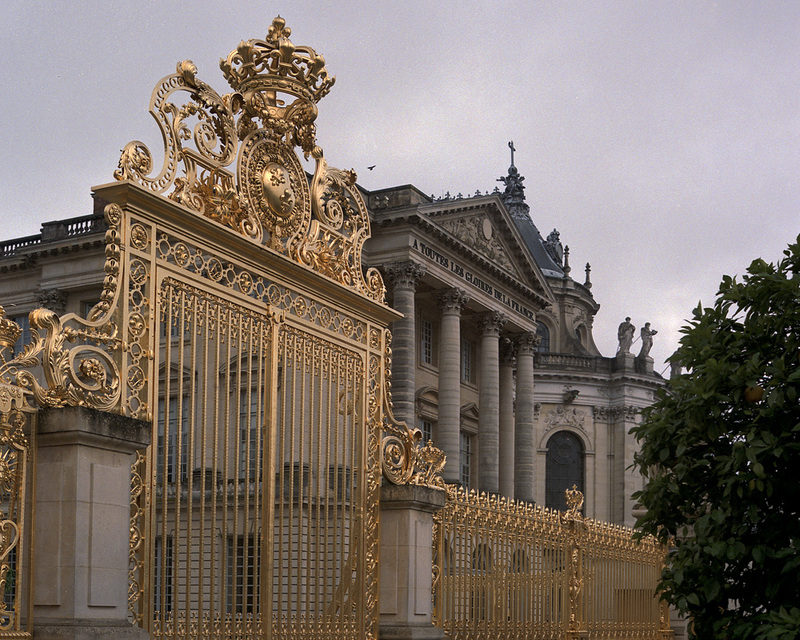 A huge part of the purpose of Versailles was to show off the wealth and power of the state. To that purpose, it lived up to it in spades. 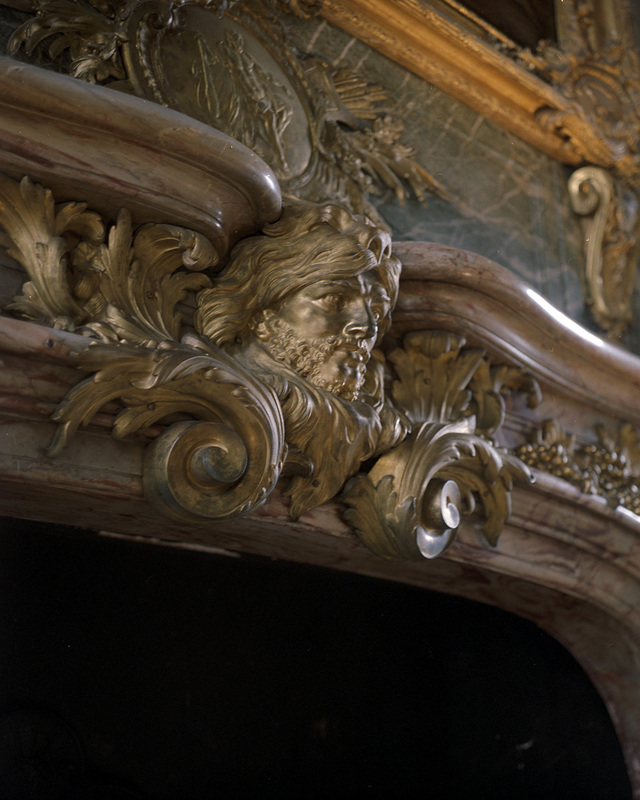 This mantlepiece is about level with my shoulders, and the head in the center is about the size of my head. You could actually walk into this fireplace. 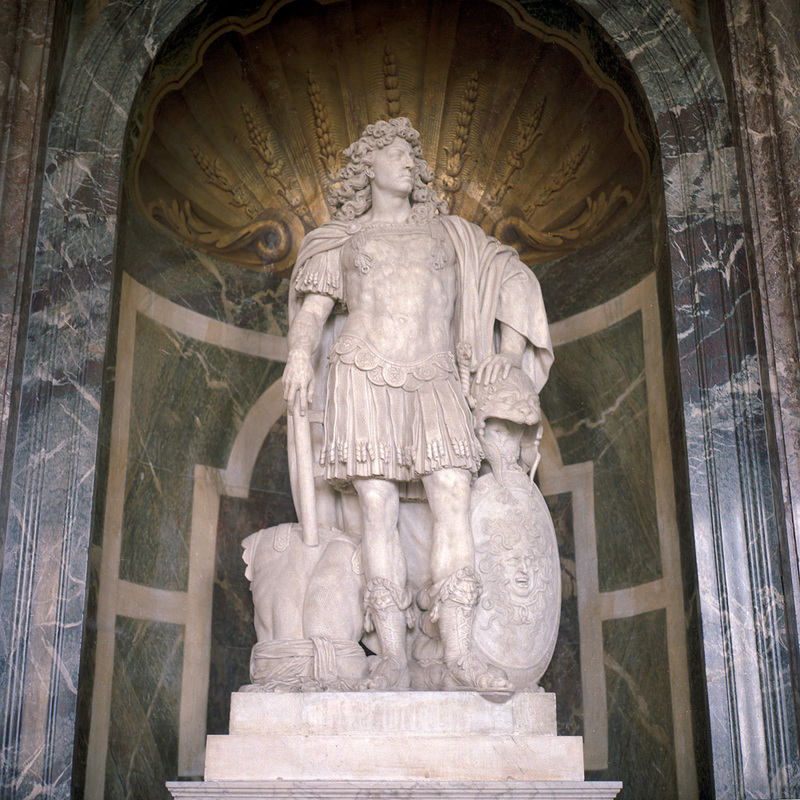 Here is Louis XIV as Mars, the God of War. 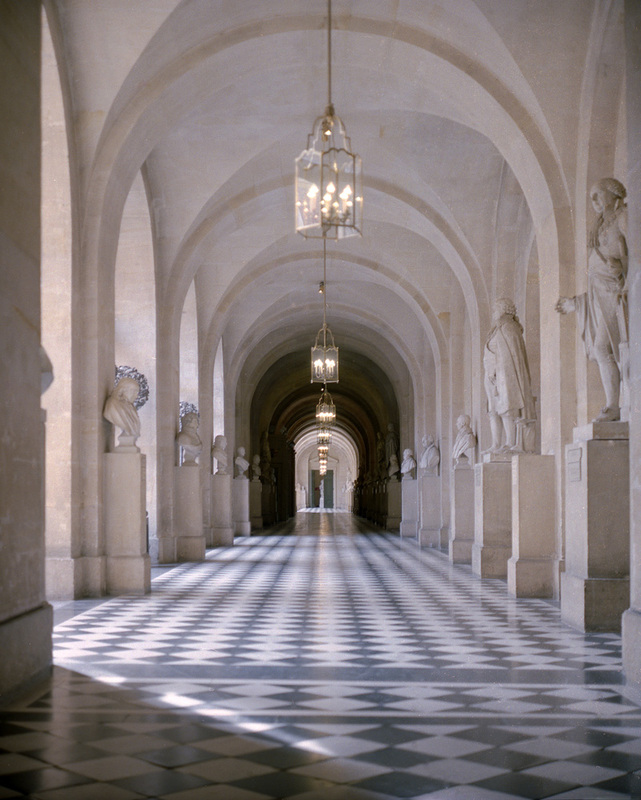 This is the one view of the Hall of Mirrors I was able to take. It’s an atypical view of the room, and as a result I’m particularly proud of it because it is representative without being cliche. 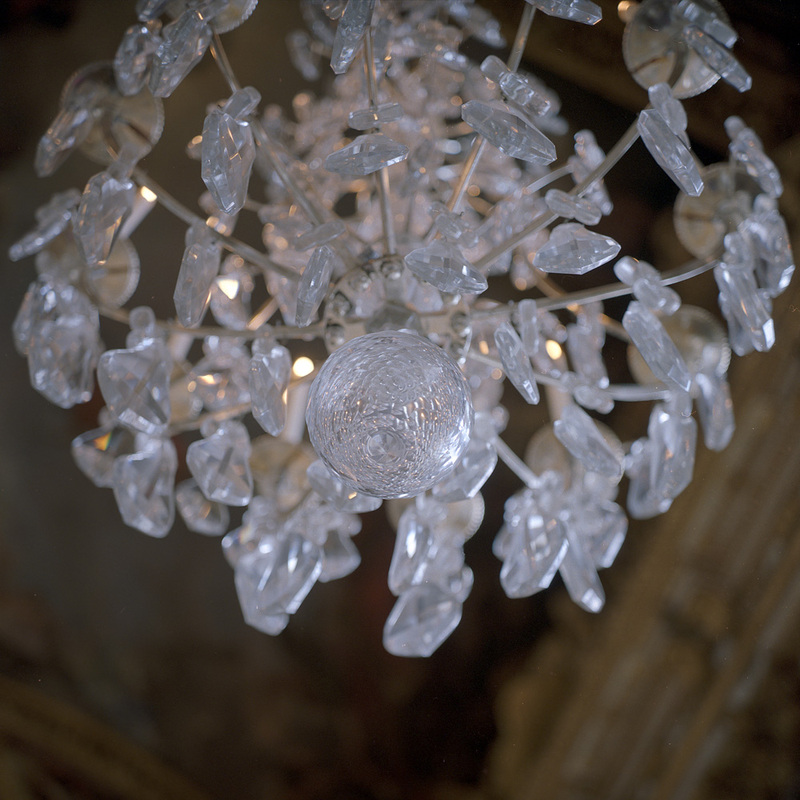 Most people when viewing the room are paying attention to the mirrors and never look up, but half the brilliance of the room comes from the crystal chandeliers reflecting and amplifying the light. 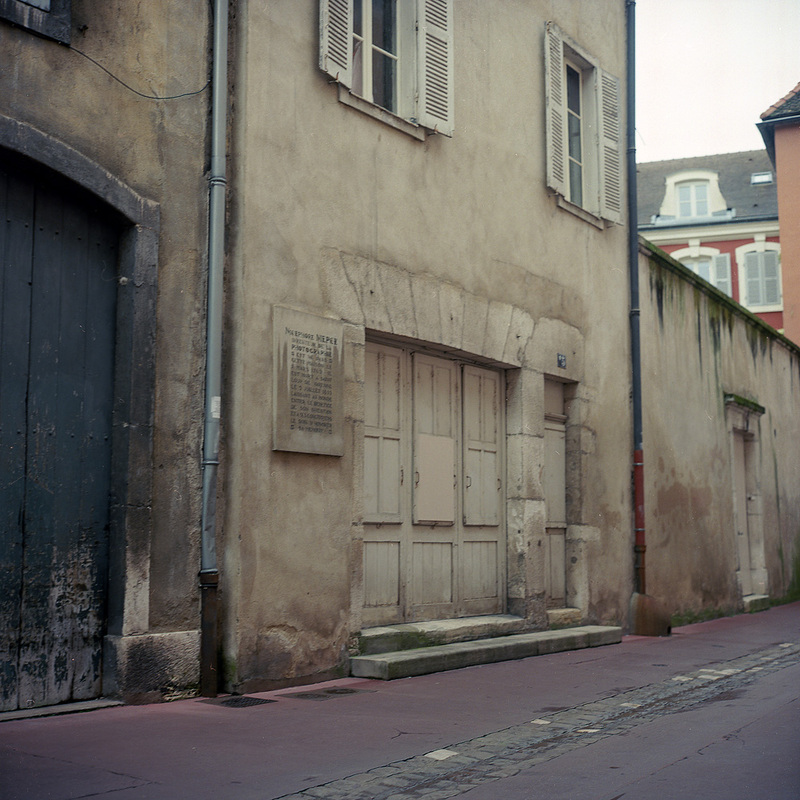 Here are some loose ends from my sojourn in Chalon-sur-Saone. You may remember the Valentin Paint ad in black-and-white – here it is in color. I couldn’t help but photograph this storefront for the combination of the beautiful if faded 1940s Art Deco facade and the psychologically jarring name. 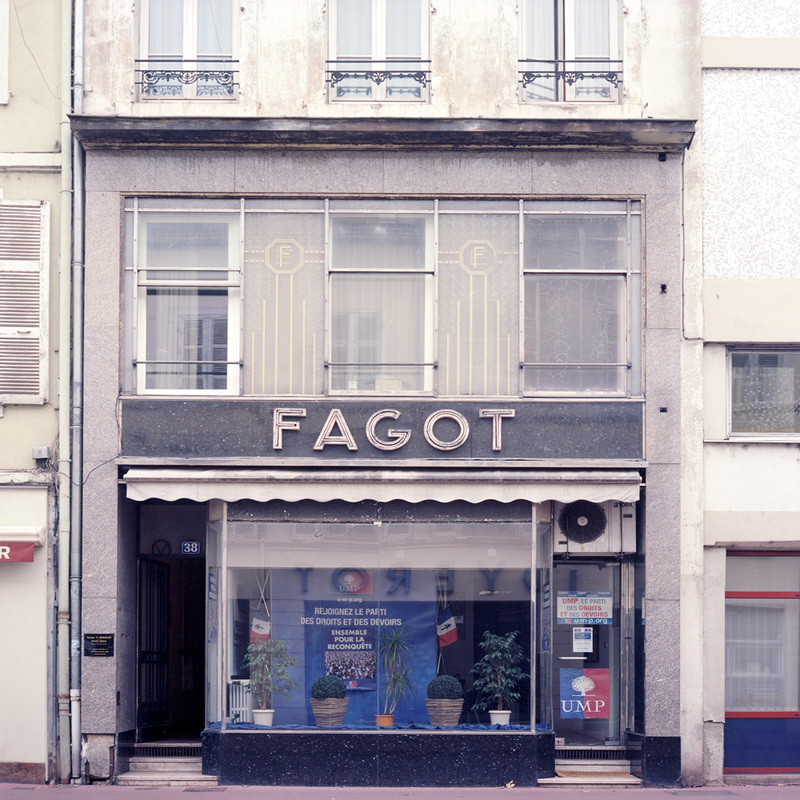 Fagot (pronounced Fah-GO) is a family name, not a slur aimed at someones sexual orientation. 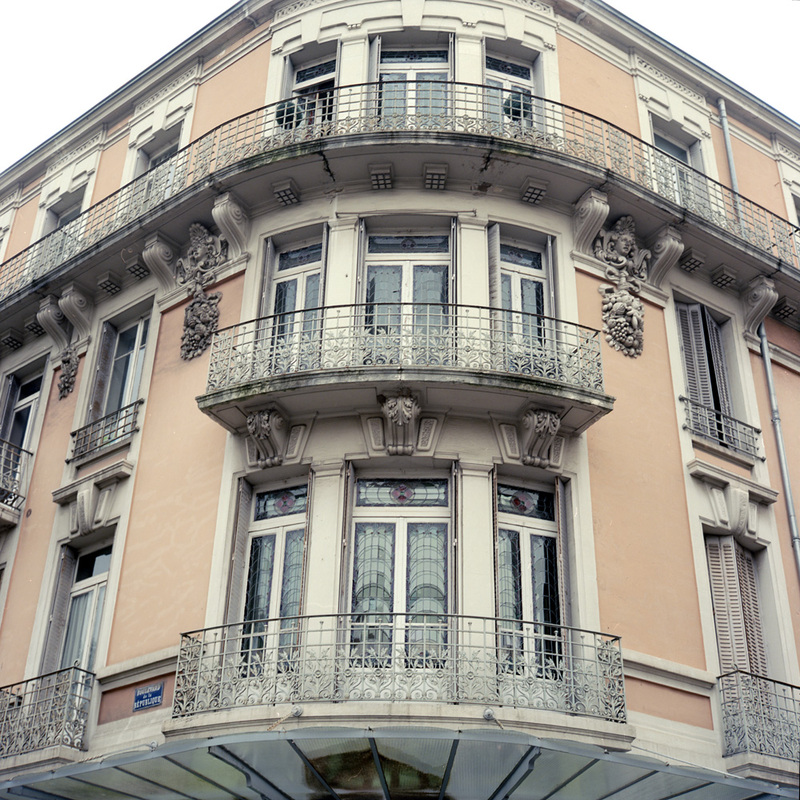 Today, instead of the original business that built the building, it is occupied by the offices of a political party. I’m a sucker for Art Nouveau and Art Deco architecture. So when I see a building like this, I have to photograph it. 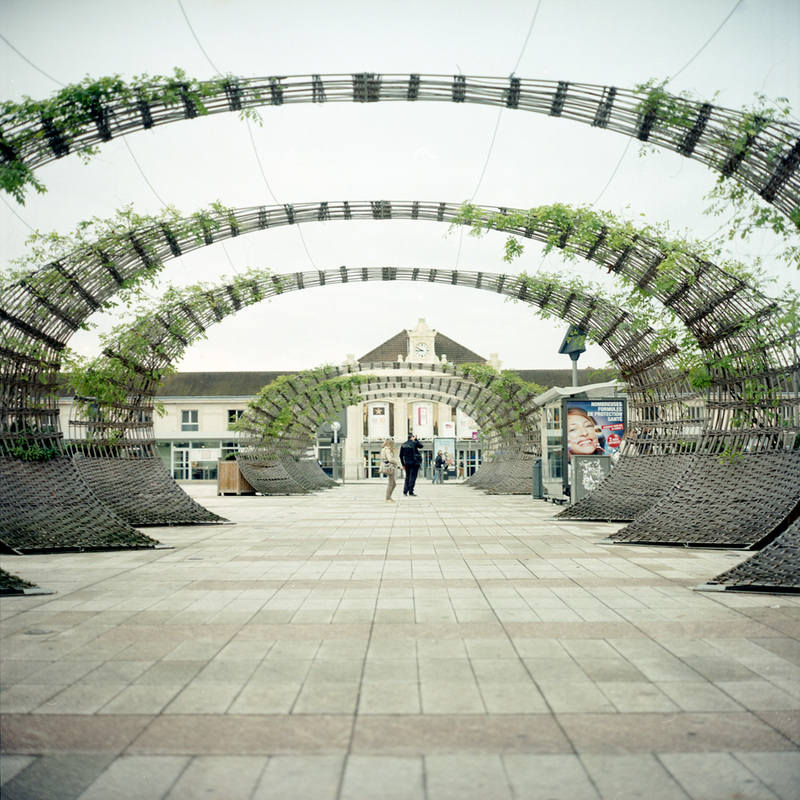 The first and last view you have of Chalon when traveling by rail is of this plaza with the modern arbors forming a tunnel to point you toward the center of town. To camera right is the St. Georges hotel, where I stayed, and to the left across the plaza is the english pub-style restaurant where I had the delicious breaded veal with the pasta the French don’t know quite what to do with. 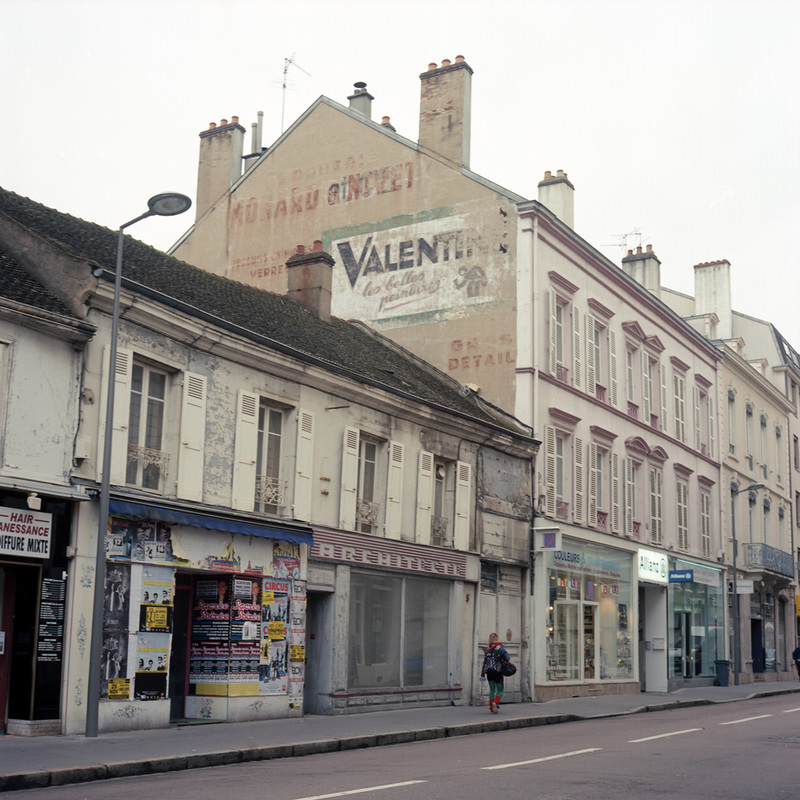 Behind is the Maitre Pierre restaurant you saw in my night photos from the hotel balcony. Around the corner from the Musee Niepce and the Chalon tourism office, I encountered this fascinating courtyard. 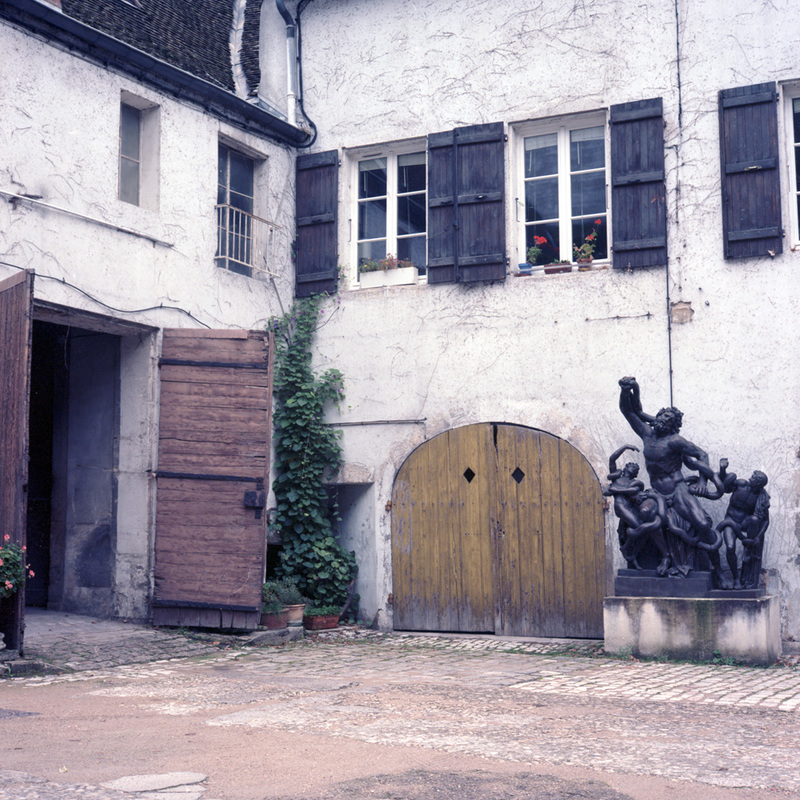 Perhaps the single most surprising element was the massive bronze Laocoon statue in an otherwise ordinary if picturesque courtyard. Why and how the statue ended up there is a mystery. If you remember your mythology, Laocoon was a Trojan priest who predicted the Greek gift of the Trojan horse but was not believed. There are multiple versions of why the gods sent serpents to strangle him and his sons, ranging from dishonesty to defiling temple virgins. Regardless of the why, his story became famous, and has been commemorated in art from ancient times. There is a Roman marble of this scene, probably modeled after a Greek one, which was then emulated multiple times in stone and metal during the Renaissance. 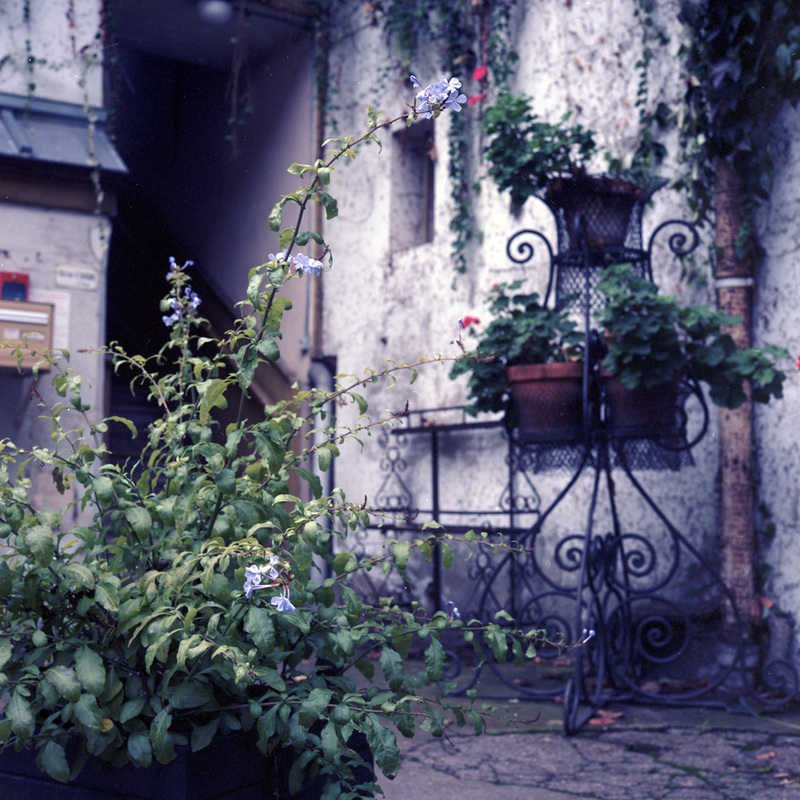 Someone who lives in this courtyard favors geraniums. 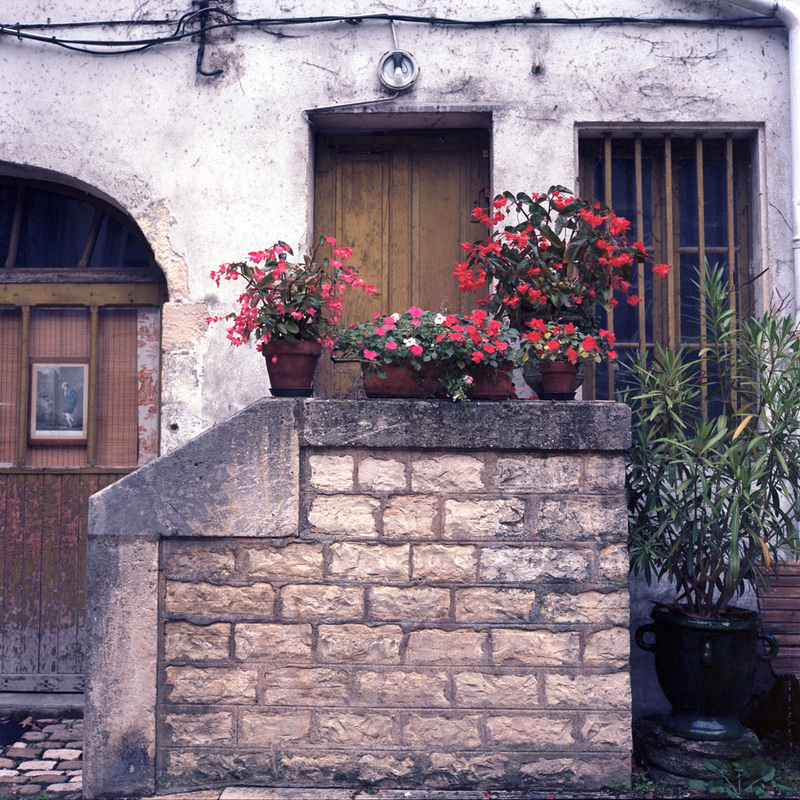 Courtyard residences seem to be extremely popular in France. I suppose it’s for the relative privacy you have compared to facing the street, especially in older urban areas where stepping out your front door puts you literally a sidewalks’ breadth away from traffic. And it provides opportunities for parking that you wouldn’t get elsewhere. 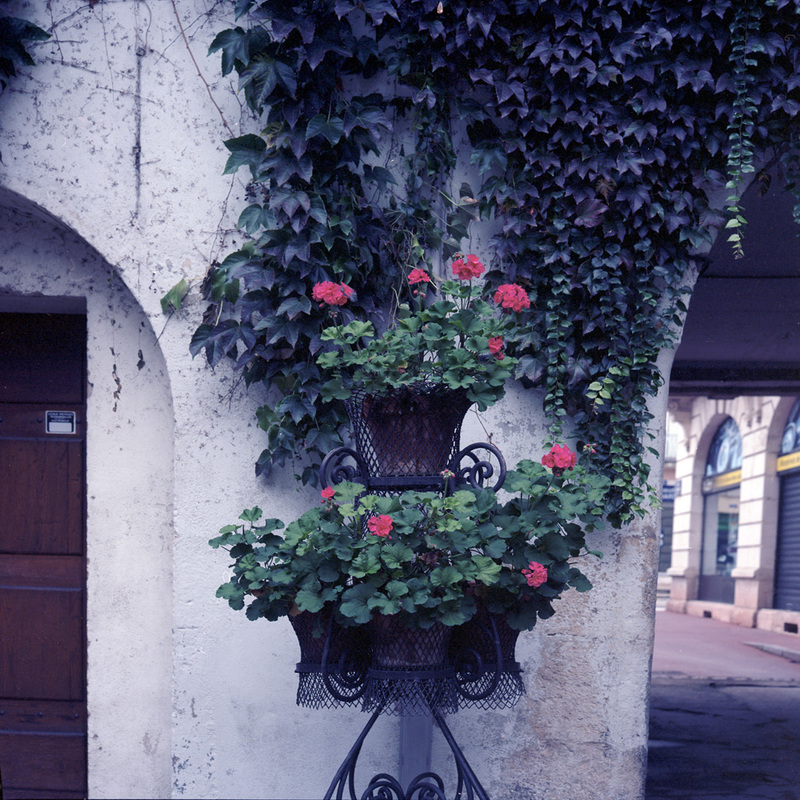 I think I’d like to live on a courtyard if I lived in Paris, or even in a town like Chalon. Who wouldn’t enjoy walking down the stairs every morning to be greeted by your own classical Greek statue? Greenery of all kinds, in fact, is a hallmark of the space. 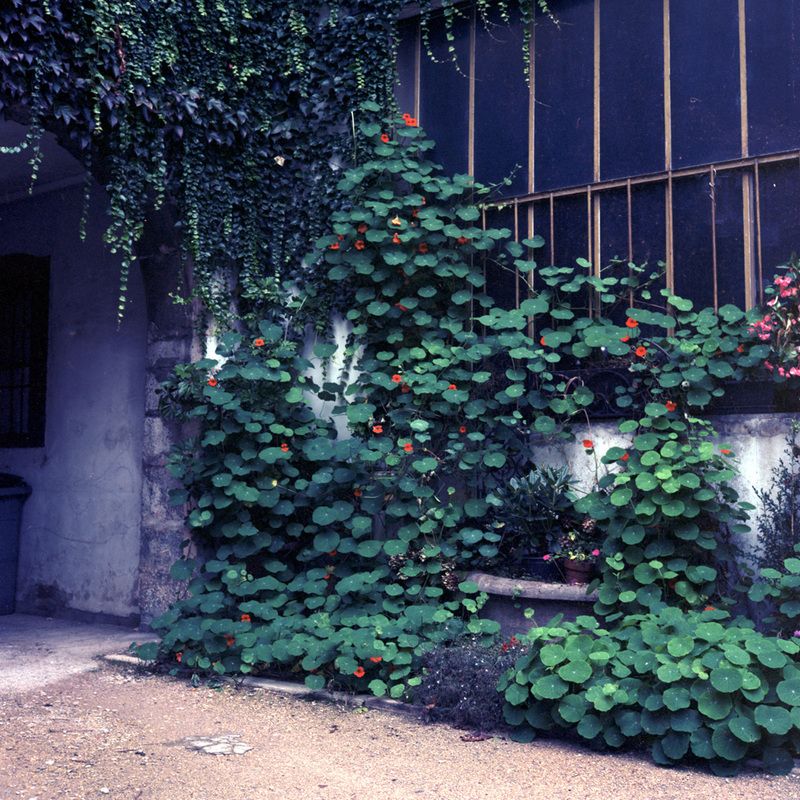 These flowering vines had taken over the wall and partially obscured the window into the workshop. If my understanding of French is any good, the workshop behind these windows was a specialist in antiques and restoration. I couldn’t tell if they were open at the time so I didn’t try to venture in. 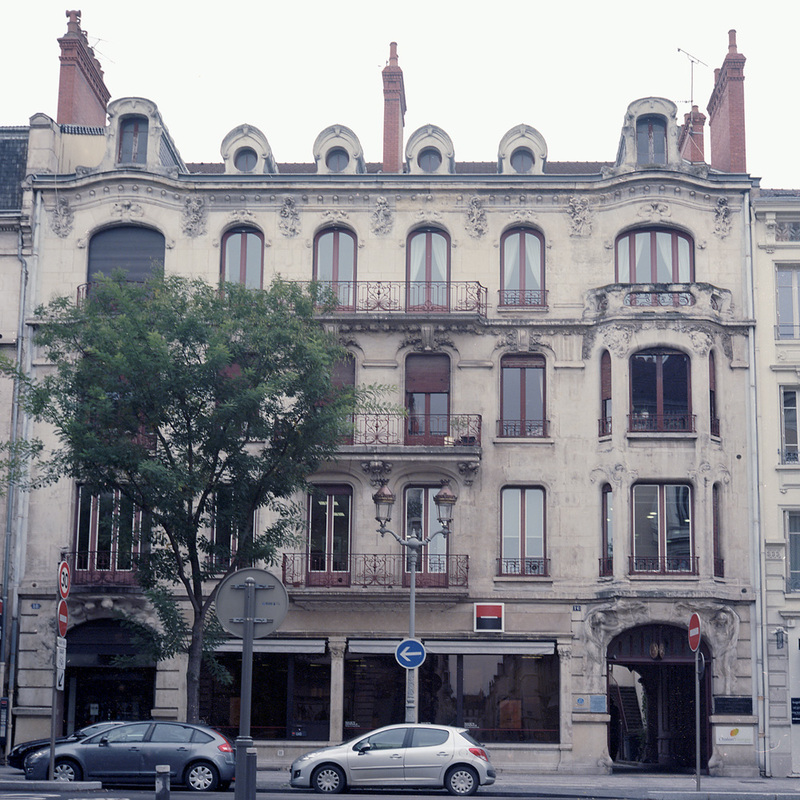 Joseph Nicephore Niepce was born in Chalon-sur-Saone on March 7, 1765 in a house at 9 (now 15 in the new address scheme) Rue De L’Oratoire. The house as it stands today is rather nondescript and gives no clue as to the inspiration behind the man who would invent photography. 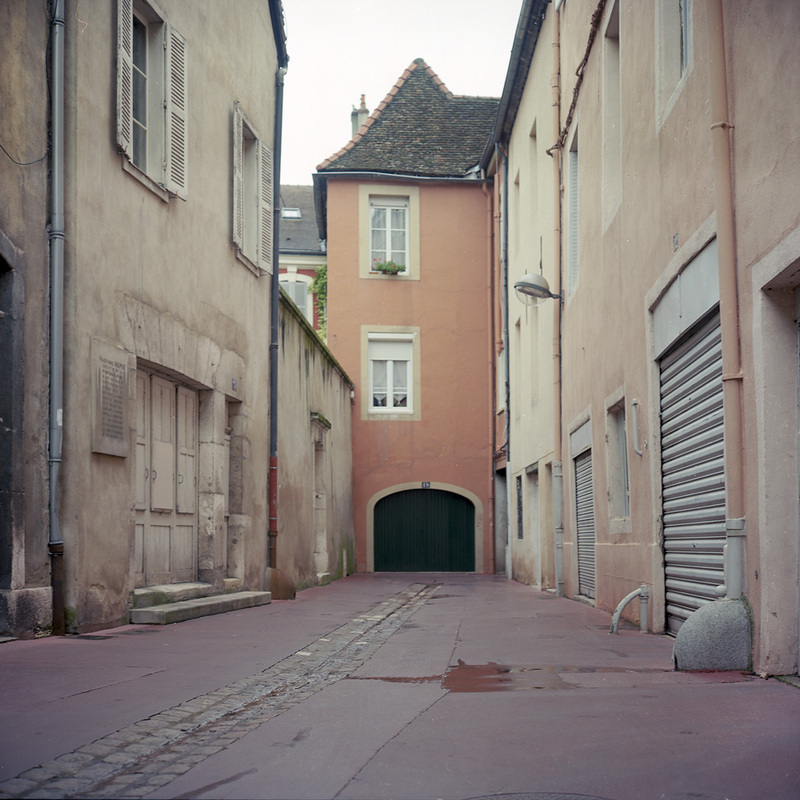 Rue De L’Oratoire is really more of an alley, closed in on one end, and the other opens to a pedestrian-only street. 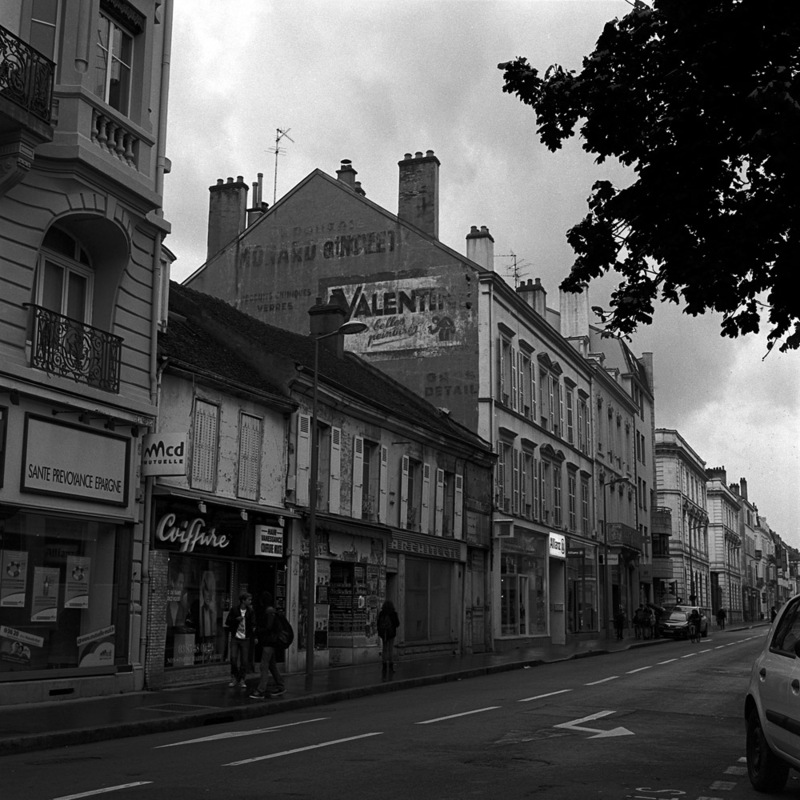 In this view of number 15, Rue De L’Oratoire, you can see the plaque on the wall indicating the house where Niepce was born. 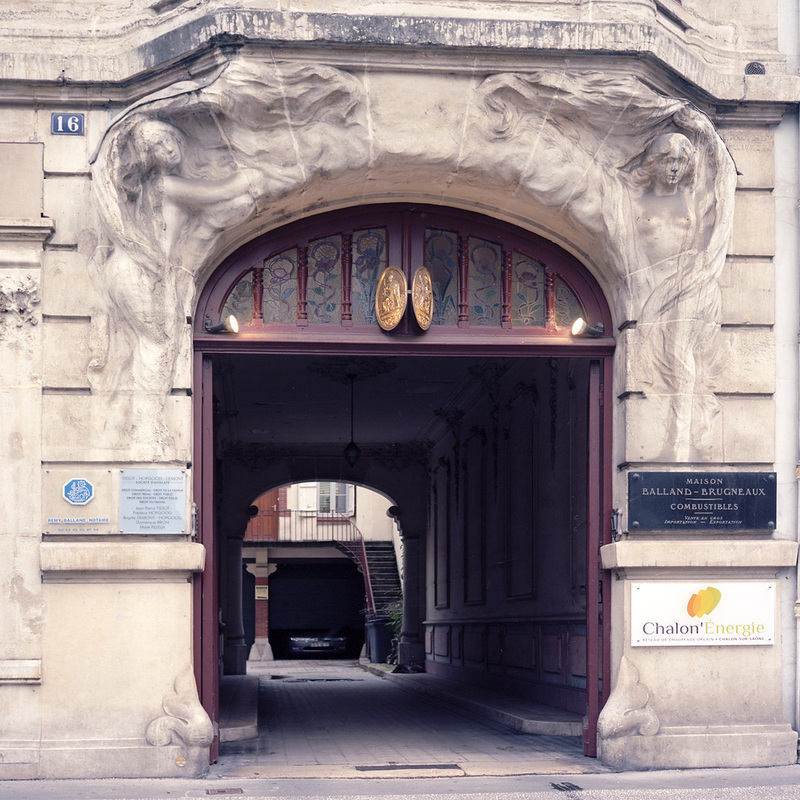 If you are approaching Rue de L’Oratoire on foot from Rue General Leclerc, there is a driveway into which you can turn, at the end of which is this very ornate iron gate and lamp, guarding a private courtyard. 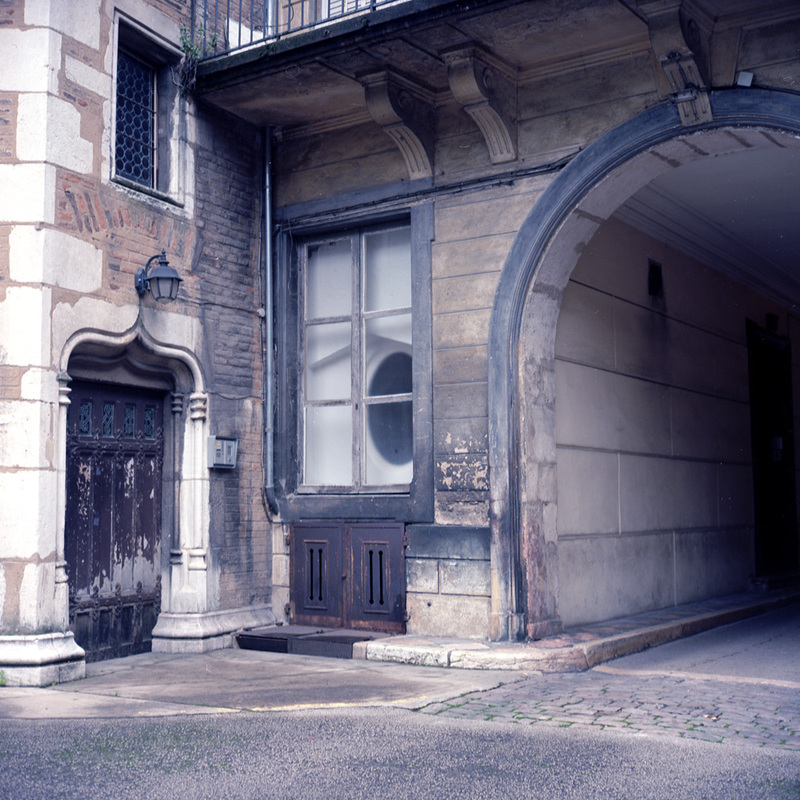 I could not confirm but I believe the front of Niepce’s house faces this courtyard, which is infinitely more appealing than the Rue de L’Oratoire side. I did not photograph the house itself as it is currently lived in by private citizens. 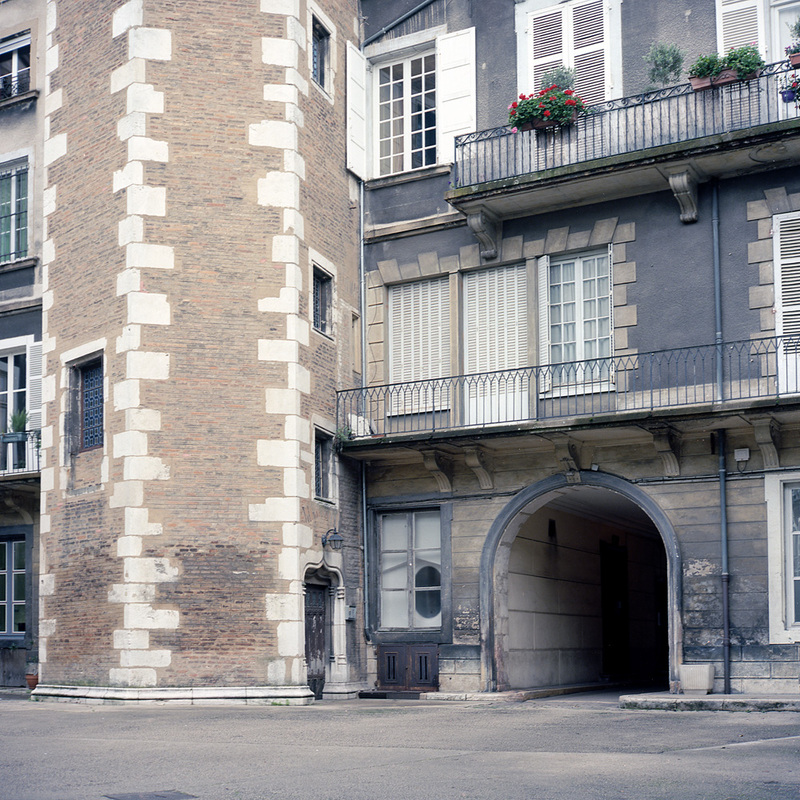 The approach to the Rue de L’Oratoire from Rue General Leclerc is through what is now a car park, at the back of which can be found the Tour Saudon, a medieval tower. I assume the car park was once gardens for the tower. 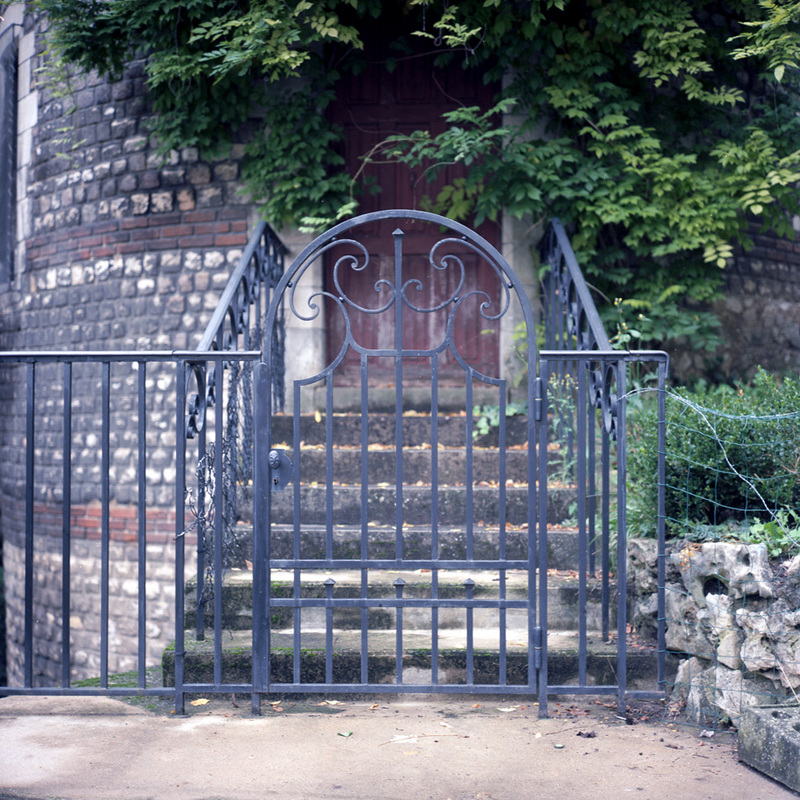 This is a close-up of the iron gate and door to the tower, which again, to the best of my ability to determine, is not open to the public. 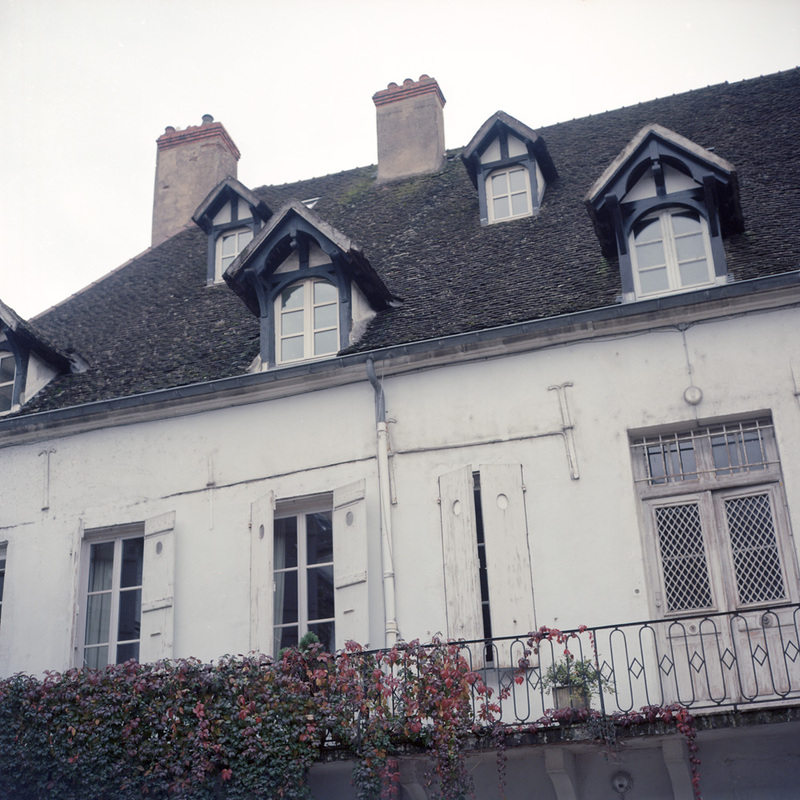 Across Rue de L’Oratoire from the Tour Saudon, there is a 17th century courtyard apartment building. I could have spent an entire day just doing a photo essay on this courtyard. 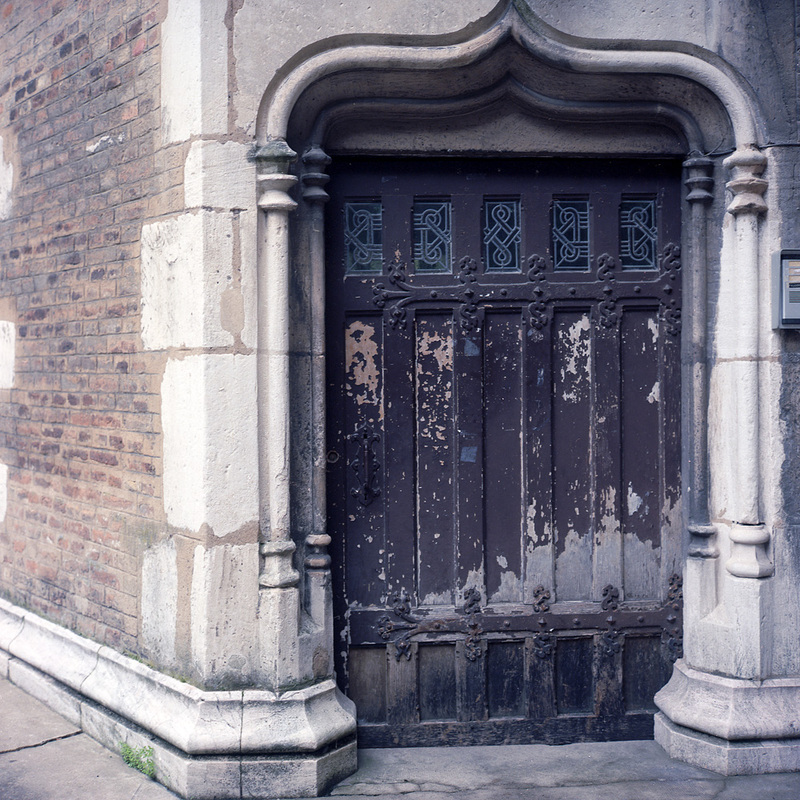 I would have loved to have seen inside some of the apartments – what would they look like now, and how would the layers of history be exposed/concealed in such a space? The red-and-black marble tile paving on the sidewalk inside the carriageway is an enchanting detail to the space, and a very clear sign of its age. It almost feels like you’re looking at a painting, and not the actual stone. 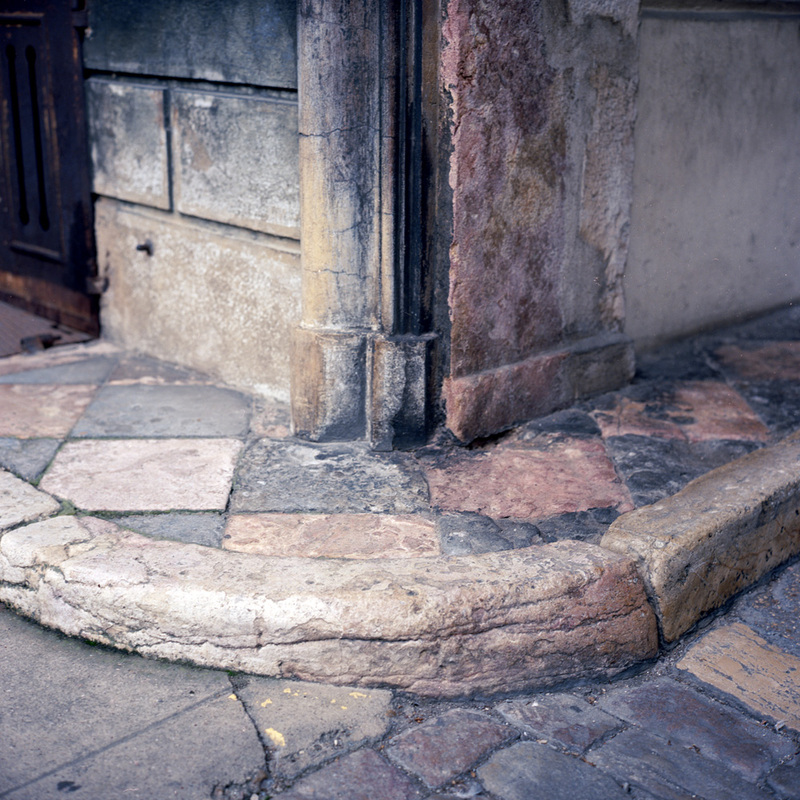 The carriageway into the courtyard is, I suspect, the primary means of vehicular ingress and egress to the Rue de L’Oratoire, as the intersecting street at the bottom of the Rue is a pedestrian-only thoroughfare. 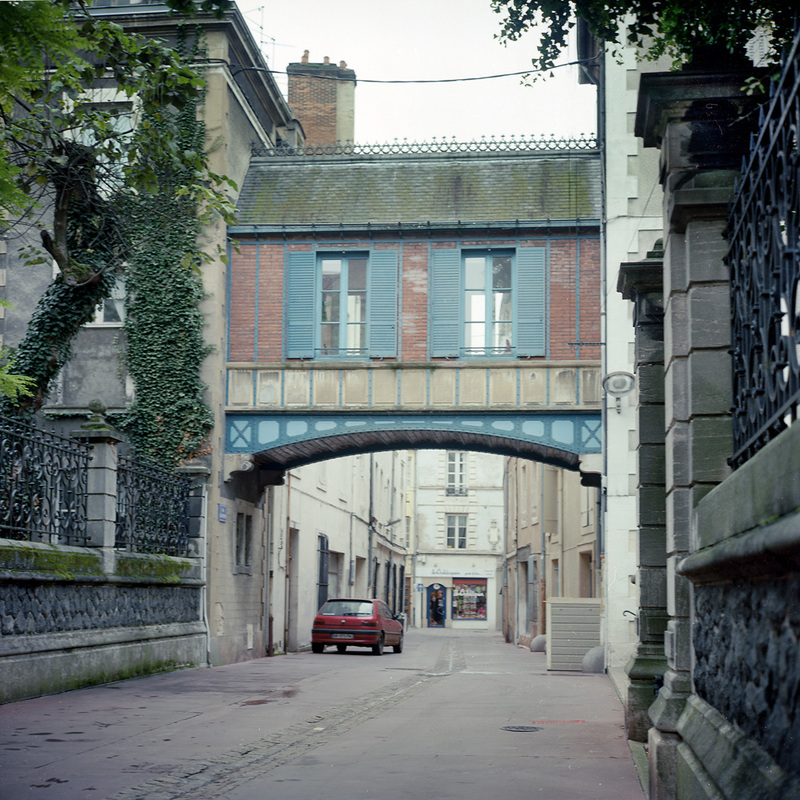 If you look through the archway over the Rue de L’Oratoire, you can see the pedestrian street, the Rue au Change. If the overpass connecting the apartment building with the building across the street looks Swiss, it should not be surprising in Chalon- it is about 70 miles (120km) to Geneva from Chalon. The building in the courtyard to which the iron gate and lamp at the top of this post is attached on the left looks just like a traditional Swiss chalet that you’d expect to see on an alpine meadow, not in the middle of a French town.